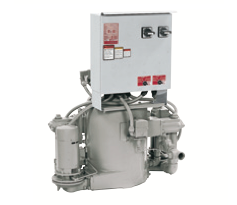 The Series MJ vacuum pump is ideal for hospital, laboratory, and industrial applications. The MJ uses the multi-jet vacuum producers to provide smooth reliable operation for years. A centrifugal pump circulates water through the multi-jet nozzle and venturi to create the vacuum. The water is discharged into a separation chamber and reused by the pump. Units available in simplex and duplex configuration.